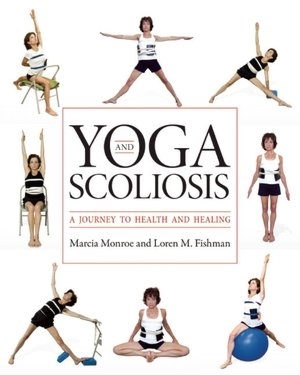 Yoga and Scoliosis by Marcia Monroe : A Journey to Health and Healing offers a deeply soothing form of moving meditation and physical activity, and a safe way to rebuild strength, stamina, and flexibility helping to address the spinal curvature of scoliosis without surgery. The book presents an evidence-based look at how this approach works. Dr. Fishman has been treating individuals with scoliosis using yoga for many years and has collected x-rays of his work, before and after, demonstrating actual lessening of the degree of curvature from the practice of Iyengar yoga. Yoga and Scoliosis: A Journey to Health and Healing is a source of encouragement, knowledge, and healing for those who have scoliosis and need to treat it, but want to avoid braces and/or surgery. It briefly covers the history and treatment modalities of scoliosis and discusses the development of the spine in the embryo. Yoga and Scoliosis explores the complexities of the concept of alignment in the body, with the main part of the book showing how to address scoliosis using Iyengar yoga. Four chapters give instruction in yoga asanas for scoliosis, and another chapter discusses yoga practice in daily living. Finally there is a Foreword by B. K. S. Iyengar, the founder of Iyengar Yoga.